Home Theatre Theatre review: Oklahoma! is more than just OK! Theatre review: Oklahoma! is more than just OK! Members of the cast of Oklahoma! kick up their heels. Photo by David Cooper. There is something special about watching a production of Rodgers and Hammerstein’s Oklahoma! given its the influence in changing the face of the American musical, as one of the first to fully integrate its songs and dances into telling its story. In fact, Oklahoma! does this so well that it may very well be the inspiration for the old adage “when the emotion is too strong for speech you sing; when it becomes too strong for song, you dance”. [pullquote]While musically this production is not quite where it should be, it is helped immensely by this cast’s abilities to find the truth in their characters, making this Oklahoma! more than just OK! [/pullquote]It seems somehow appropriate that Studio 58, the professional theatre training program at Langara College, should tackle this particular musical as a learning moment for its students given its place in the history books. More importantly though, even after 72 years Oklahoma! still manages to entertain, and is a testament to both its surprisingly enduring story, and many of the acting choices made by the cast in this production. 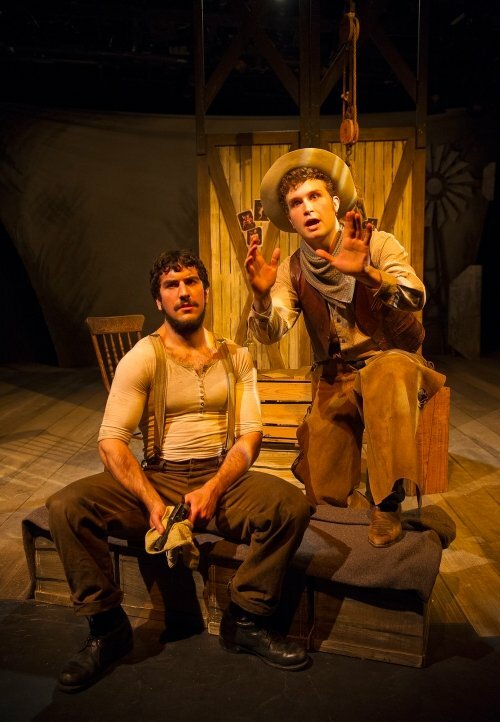 Telling the story of life in the territory before it became part of the Union, the bulk of the storyline follows the relationships of its townsfolk, whether of the romantic variety or in the clash between farmer and cowboy. As both the men and women spend much of their time pursuing each other, there are also a number of sub-plots that are surprisingly contemporary for a musical written in 1943. Owen Bishop as Curly and Kamyar Pazandeh as Jud Fry. Photo by David Cooper. The thing to remember though about Studio 58 is that it is not a musical theatre training program. As with its production of Grease last year, the cast easily connects emotionally with their characters and brings them to life, but they aren’t always quite as successful with the music. But even as some of the singing was a little hesitant and lacked the power necessary to carry some of its iconic songs, it wasn’t enough to detract from a show that never felt it’s nearly three hours. 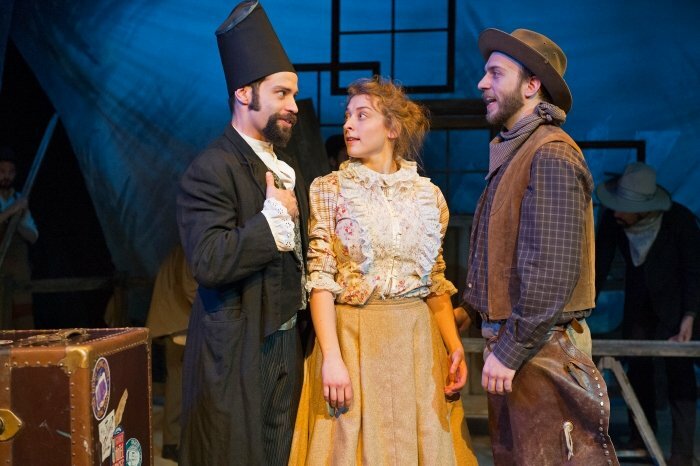 Much of the success in this production comes from the choices made by its cast, and none more evident than Kamyar Pazandeh’s performance as the angry ranch hand Jud Fry. A difficult role as it is easy to overplay the character’s rage, Pazandeh is restrained for the most part, strutting tight-fisted through his scenes, seemingly ready to explode at any moment. With help from Owen Bishop as Curly, the always tough “Pore Jud is Daid”, is grounded and never allowed to stray into the absurd. That Fry has a wonderful baritone, and one of the better voices of the night, is a bonus. On the comedy side Adelleh Furseth and Arash Ghorbani make the most of their characters Ado Annie and Ali Hakim. Furseth is particularly good here as she embraces Ado Annie’s quirkiness with little restraint; her rendition of “I Cain’t Say No” is another of this show’s highlights. Ghorbani proves himself again after his terrific performance in last year’s One Flew Over the Cuckoo’s Nest, giving a suitably manic performance as the traveling peddler who refuses to be trapped by any woman. Arash Bhorbani, Adelleh Furseth and Sean Sonier. Photo by David Cooper. 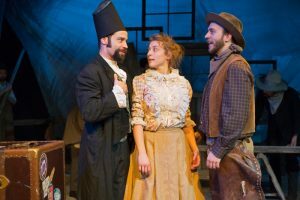 As the central love story, Owen Bishop and Alexandra Wever do a nice job as Curly and Laurey, but don’t quite have the pipes to quite fill even the Studio 58 space. It is a shame too, and perhaps it could have been mitigated by amplification, because Wever appears to have a beautifully old-fashioned quality to her voice that seems perfect for this role. Like every Studio 58 production before it, the ensemble is so full of energy that it helps to forgive some of the weakness in the songs. But even while they may not be perfect musically, they nail Shelley Stewart Hunt’s choreography, that at times is barely contained within such a small space. The Dream Sequence is beautifully realized, as the dance comes together with some inventive visuals. 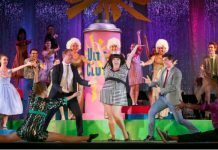 Musical director Christopher King conducts his small five-piece band with skill, but even as they try not to overplay the singers, it is difficult in the confines of the Studio 58 theatre. Drew Facey’s set is kept simple to allow for this rather large cast to play, but the choice to drape the upstage area with openings at either end is problematic, making the actors visible and telegraphing another group number each time they took their positions. There is also a dizzying effect that is highlited by the design as director David Hudgins has the majority of those entrances made up stage left and the exits made up stage right. 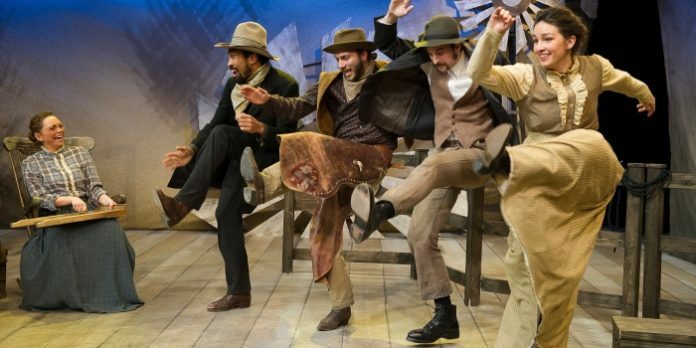 Costume designer (Costume Diva in the program) Marina Szijarto distinguishes the farmers from the cowboys nicely, and while it may have been accurate to the time, I did yearn for some colour. While musically this production is not quite where it should be, it is helped immensely by this cast’s abilities to find the truth in their characters, making this Oklahoma! more than just OK! Oklahoma! Music by Richard Rodgers. Book and lyrics by Oscar Hammerstein II. Based on the play “Green Grow the Lilacs” by Lynn Riggs. A Studio 58 production. On stage at Studio 58 (100 West 49 Ave, Vancouver) until March 1. Visit http://studio58.ca for tickets and information.